I've never actually done an empties post before because it seems to take me so long to finish off products and I don't have the room (thanks to starting to buy stuff ready to move out and then being made redundant) to store empty containers while I wait for a few to build up. However, I noticed that three of my products were about to run out at roughly the same time, so I thought I would do my first ever empties post. Last summer I tried a sample sachet of Origins GinZing energy-boosting moisturiser and loved it so much my boyfriend decided he needed to treat me to it. I've used this pretty much every morning since and it's only just running out now, there's just a tiny bit left in the bottom. This is a lovely light gel cream type moisturiser and even though I have dry skin this is enough for me in the morning unless my skin has become particularly dehydrated. During last years humid summer this was so refreshing after a sticky nights sleep and it really perked my skin up each morning. Of course it also smells amazing with a lovely light zingy citrus scent. This was one of the products that made it to my top 5 skincare products of 2013. Would I repurchase? Yes definitely, but not just yet as I have other products I want to try and use up first, many of which have been neglected because of my love for this. 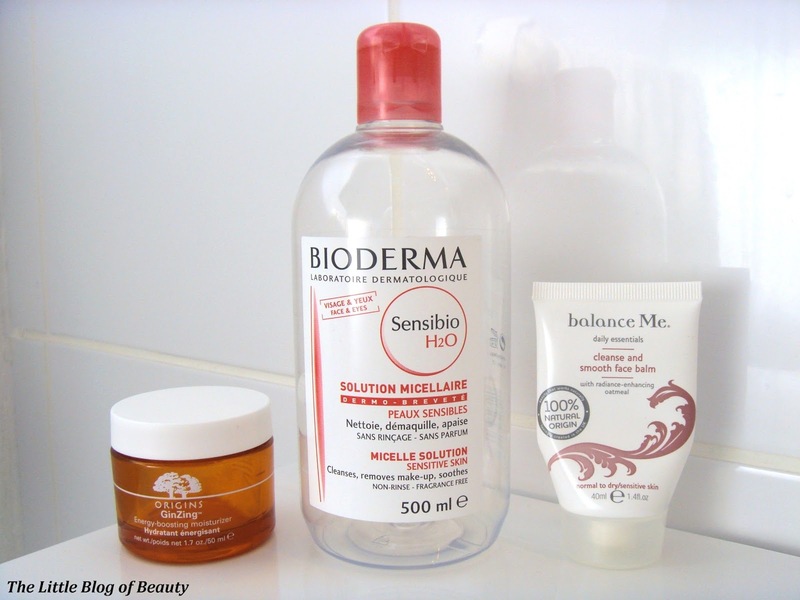 I picked up a big 500ml bottle of Bioderma Sensibio H20 sollution micellaire last year when Escentual ran a French pharmacy promotion with up to 1/3 off (unfortunately Bioderma isn't included in their current French pharmacy promotion). I love that this doesn't leave my skin sore and irritated after I've removed my makeup (a problem I've had in the past with lots of makeup removers) and it also doesn't dehydrate my skin at all but leaves it feeling soft and smooth. I also find this works well removing my favourite They're Real mascara without irritating my eyes. This also made it into my top 5 skincare products of 2013. Would I repurchase? Yes I would, but I'm tempted to try out a couple of drugstore versions (as this is really a bit out of my price range) and also I currently have a litre of Bioderma to get through after I won a bottle from Bioderma over Christmas and Escentual very kindly sent me a bottle along with a product I'm testing for them. I'm a big fan of most of balance Me products and my favourite is probably the balance Me Cleanse and smooth face balm. The first time I used this I couldn't believe how smooth and soft it left my skin and my skin has looked better than it ever has before since using this. Oh, and guess what? This also made it into my top 5 skincare products of 2013! Would I repurchase? Yes I would, although again this is a bit out of my price range and I do have some other products I should really use up before I see if I can stretch to this again. Do you use up many products? I also never post empties posts because I never go through so much products per month (it seems I have a huge stash and well... I do ;) ). I LOVE Bioderma, I still think it's the best with no irritation and great make up removing power. I finished my Bioderma's Micellaire's water and it did wonders for my skin! Thanks for reminding me to get a new one!